We all need a good, reliable recipe for rolled sugar cookies to use with our cookie cutters. Over the years I’ve tried many from cookbook authors and have come to adore some of them. In order for me to really like these types of cookies they not only have to taste good, but the dough has to be easy to work with and the cookies should hold their shape during baking. These are the most fun to ice and decorate with sugars and royal icing. After consulting some recipes in my archives and testing doughs, the formula I’ve come up with delivers the goods. I find many sugar cookie doughs to contain an enormous amount of sugar and eggs, both of which can cause distorted shapes if used in great quantities. With this in mind, I decided to give a previous recipe new proportions. With only one egg and less sugar than a standard sugar cookie recipe, what comes out of the oven is a buttery cookie that is more akin to shortbread. I love shortbread. It’s perhaps one of the best cookies ever. The cut out shapes are perfect for a treatment of royal icing and sugar decorations, so use your best cutters when creating edible artwork. 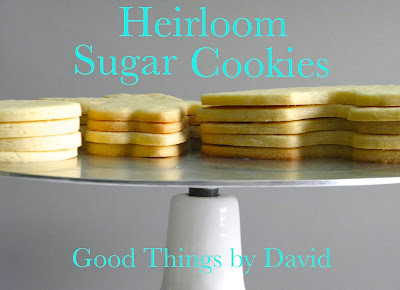 Think of these Heirloom Sugar Cookies when you’re planning a party, a shower, a wedding or for the many holidays during the year. Yield: approximately sixteen 5-6" cookies or approximately forty-five 3" cookies. Equipment: parchment-lined or silpat-lined baking sheets. In a bowl, whisk to combine the flour and fine sea salt. In the bowl of a stand mixer fitted with the paddle attachment, cream the butter on medium speed for 1 minute, just until malleable. Add the sugar and continue to beat on medium speed for 3-4 minutes or until lightened & creamy. Stop & scrape the bowl and paddle. Add the egg on medium speed and beat until combined. Beat in the extracts. Stop and scrape down the bowl & paddle. On low speed add the dry ingredients and beat until a mass of dough forms. You don’t want a crumbly mass. It should begin to pull away from the sides. Divide the dough in half between overlapping pieces of plastic wrap and shape into flat disks. Refrigerate the dough for at least one hour. The dough can be kept in the refrigerator for up to 2 days or it can be frozen for up to 1 month (if freezing, place the wrapped dough in a zip-top freezer bag). Working with one disk of at a time, roll out the dough on a lightly floured surface to 1/8" in thickness. If you roll a thicker cookie, the yield will be smaller. I find using the same piece of plastic wrap to roll out this type of dough very helpful. For a how-to lesson on rolling out cookie dough, click [Here]. Cut out your shapes as close as possible so that you maximize your dough and minimize having to roll out scraps. Having said that, scraps of dough can be rolled out twice (chill the scraps to make it easy to roll out). Place the cut outs on your prepared baking sheets, spacing them about 2" in between each shape. Chill the cutouts for 30 minutes. Note: you will be able to fit eight 3" cookies per half sheet. For larger cookies, you may be able to fit only 3 cookies. Bake each sheet of 3" cookies for approximately 12-14 minutes. Bake 5-6" cookies for approximately 13-16 minutes. When the cookies are done, remove them from the oven and let them cool on the sheets for about 5 minutes before transferring them onto cooling racks. Once on the racks, let them cool completely before icing them. The baked cookies can be stored in an airtight container for up to 3 days or they can be frozen for up to a month. Frozen cookies should be left to thaw overnight in a refrigerator. NOTE: My Heirloom Sugar Cookies can be decorated and frozen ahead of time. For a full tutorial, please click here. I hope you try my Sugar Cookies. You are absolutely right about finding the right dough to make cut-out cookies.. I have to make "fish" cookies for a childs party next weekend..I'm going to use your recipe! Thanks, David! I am a follower of yours and Janet's blogs and am very excited about the news of forthcoming cookie cutters. I am looking forward to making some of these cookies soon. Amy, THANK YOU for following and yes, it is exciting to be venturing with Janet into the cookie cutter arena. Thanks for this recipe. I came over from Janet's blog following the link she provided. Looking forward to seeing more of your blog. Janet has raved about you and your cookie cutters and cookies. I'm so glad I've been able to subscribe to your blog via email. Thanks so much. Alice, how nice to have you reading along! I appreciate it immensely! Do try the sugar cookie recipe because it's delicious. Janet is a DOLL!!! Love her! Excellent Martha! I know you're going to love it. Your cookies will bake beautifully and taste out of this world! David, this recipe worked like a charm. I am so grateful! I baked and decorated 100+ cookies for my son's first birthday and the shapes held up so beautifully. The royal icing recipe you shared from Janet's blog was fantastic as well. Thank you so much! I'm glad you had success with those recipes and that your son's cookies turned out fantastic! It's nice to hear people baking and sharing these types of memories. Try this recipe, Marie. It's such a pleasure to work with and your cutouts will retain their shapes. Plus, it's delicious! David, I would like to try your recipe. I was thinking of using egg yolk icing (egg yolk and dye). Since it's applied before the cookies are baked, is it okay to freeze the cookies? That sounds wonderful. I've never used tempera to paint my cookies, but I don't see why it wouldn't work. Yes, by all means the cookies can be frozen. Your recipe is accurate and delicious. I used tempera to paint my cookies. I had a "hand" cookie cutter and painted the fingertips red. Very cute. What I like about it is that they can then be frozen, unlike regular icing. Your recipe is on my list to make at Christmastime. Thanks! Hi David! Just wanted to let you know, that I found my "forever sugar cookie"! Your cookie is absolutely perfect! The dough was sooo easy to work with, the shape held perfectly and it was out-of-this-world delicious! Believe me, I have tried many many sugar cookie recipes and this is by far the best sugar cookie I've ever worked with and tasted. I really love and appreciate your blog, with all it's pictures and recipes. I hope and pray that your niece Audrey is doing well! Beth, thank you for your concern re: my niece. She's doing absolutely well!! Oh those look perfect! I've been needing a reliable cookie for cutting out. The recipe I've been using I've had mixed results, and I love that vintage wire rack! Bernie, these cookies are always delicious and the recipe is very reliable. Please make it soon and let me know what you think! Anonymous, my cookies will hold their shape and travel well as long as you roll them out thick. Whether you're transporting them by car or by mail, in order for them to keep from breaking, you must roll out the dough to 1/4" in thickness. Anything thinner will always be precarious in those situations. Thin cookies, 1/8" or 1/16" are OK if you're going to enjoy them at home. Shipping/transporting is another thing altogether. Let larger cookies cool completely on the baking sheets so that they are firm, before moving them to racks or elsewhere. Yes, Anonymous, the recipe calls for 1 large egg at room temperature. It's there after the granulated sugar. In the recipe steps, it says "add the egg". One egg. That is very odd. I've never found this recipe to come out sticky and I've made it dozens upon dozens of times. Did you add more than one egg? Perhaps you used a different flour this time from the one you used the last time? This recipe is pretty much a sable/shortbread type dough and shouldn't come out sticky. If anything, it may be on the dry side. I don't, but I will get that done soon! I should have a printable version. would I be messing things up if i used about a 1/4 cup more sugar? Thank You Soo! !, like my Mom & Dad used to say, "IF AINT BROKE, DON'T FIX" WILL LEAVE AS IS AND REPORT BACK TO USE SOON!! MAYBE MAKE A HALF BATCH TO START, THANK YOU AGAIN FOR THE QUICK RESPONSE AND INFO. I'm making these to mail to my daughter so will use your suggestion to roll to 1/4". Approximately how much baking time would this add? Melissa, I'm so glad that you're making these! Even at 1/4" in thickness, the cookies can be baked for approximately 2 extra minutes, depending on the size of the cutout cookie. I would recommend that you look at your cookies at the lower baking time and see if they are taking on any color around the bottom edges. If you see them slightly colored, they're done!